Former Georgian President and ex-chairman of Odesa Regional State Administration Mikheil Saakashvili, who was detained by Kyiv law enforcers late Friday after being put on a wanted list, stated through his lawyer that he was starting a hunger strike. "Saakashvili declares the beginning of an indefinite hunger strike, and he will also oppose any attempts at compulsory feeding," Saakashvili’s lawyer Ruslan Chernolutsky said after investigative actions against his client were completed. Also, Chernolutsky added that if the court passes a decision to select a 60-day custody as a preventive measure, Saakashvili "will go on an even harsher hunger strike." Read alsoMikheil Saakashvili detained in KyivAs UNIAN reported, in the late hours of Friday, December 8, law enforcers detained Mikheil Saakashvili in one of Kyiv’s residential districts and took him to the SBU’s pre-trial detention center. Saakashvili’s supporters throughout the night outside the detention center amid tight security measures in the area. After the completion of the investigative actions, spokesperson for the Prosecutor General, Larysa Sargan, said that the prosecutor's office would ask the court to elect house arrest as a preventive measure against Saakashvili with an obligation to wear an ankle bracelet worn. At the same time, she stressed that all actions against the ex-head of Odesa Regional State Administration had been carried out in line with procedural legislation. As UNIAN reported earlier, Larysa Sargan on December 6 announced that leader of the Movement of New Forces Party, former governor of Odesa region and ex-president of Georgia Mikheil Saakashvili was suspected of committing a crime under Part 1 of Article 15, Part 2 of Article 28, and Part 2 of Article 256 of the Criminal Code of Ukraine. He was put on a wanted list. 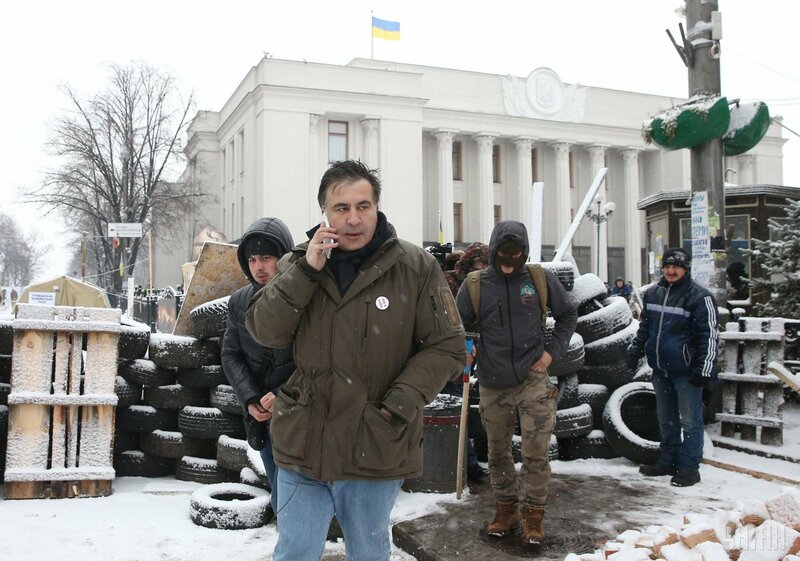 Earlier, on December 5, the SBU and prosecutors raided an apartment where Saakashvili resides on Kostiolna Street. Later, Saakashvili was detained and put him in a convoy vehicle of the SBU, but a crowd of the politician's supporters blocked the car from driving him away. Clashes between law enforcers and activists followed. Then, someone from the crowd smashed the van's windows, damaged the back door, and helped Saakashvili get out of the vehicle. Law enforcers limited themselves to using tear gas during the clashes. Read alsoLutsenko says law enforcers showed "unacceptable weakness" as Saakashvili "released" by crowdAfter the "escape," Saakashvili led his supporters to rally outside the Verkhovna Rada where Prosecutor General Yuriy Lutsenko was presenting evidence of the politician's wrongdoings. Yuriy Lutsenko said that Saakashvili had organized protests in order to seize state power in Ukraine and help members of the criminal group associated with the former Ukrainian President, Viktor Yanukovych, and a young tycoon from Yanukovych team, Serhiy Kurchenko, in hindering the process of their criminal prosecution. In turn, Saakashvili denied Lutsenko's accusations of assisting participants in criminal organizations.